Russia’s lower house of parliament has passed a law allowing electronic voting in public elections – despite complaints that MPs’ own electronic voting system was being abused. Mr Ivanov, an MP for the Liberal Democratic Party, appeared to cast doubt on the reliability of any electronic voting, based on his colleagues’ behaviour in the State Duma. 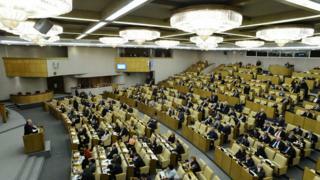 The three bills – on new forms of voting in elections – were passed by the Duma at their first reading. One of them was on the introduction of remote electronic voting in Moscow’s city council elections on 8 September.